IFAMA is a membership organization that brings together the world's leading scholars and students, industry and NGO professionals, and policy makers to improve the strategic focus, transparency, sustainability and responsiveness of the food and agribusiness system. 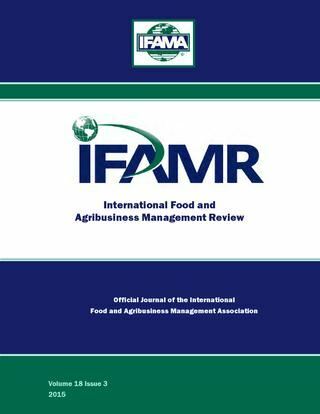 Through a world-class journal and international events IFAMA acts as a catalyst and clearinghouse for ideas and talent, strengthening ties between stakeholders and advancing the sector as a whole. You can still submit a paper / case / abstract. Scroll down to reach the submission link. NOTE: Beat the Fee Increase of May 30, if you haven't yet registered, do so now! Also, visit to Alibaba HQ will - due to capacity constraints - be capped in terms of number of guests. As of April 14, ALL registrants are guaranteed a spot for this visit, if you have not yet done so register now, to secure your own spot! b- Hotel information here, posted Mar 10 . Please note that the distance from the HQ hotel and the university (Sat-Sun academic program) is approximately one mile, walkable. c- From/to Pudong airport here, posted Mar 10, also with instructions for those who would like to try one of the 130 bullet trains connecting Shanghai and Hangzhou, here, posted Apr 14. Schedule draft as of March 15. Land use policies in China. "Anticipated Futures for Modern Rural Economies"
"Importance of good ag practices". Ifama offers early bird registration discounts, Register early! 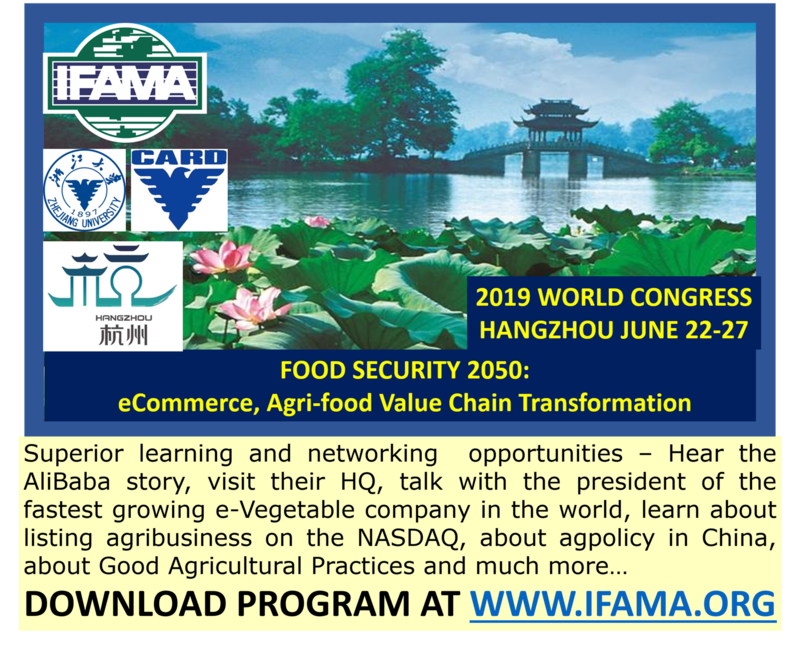 An additional discount is available to IFAMA Members, who have paid their 2019 dues. It pays to be an IFAMA member. Authors will be able to submit a full paper or case, to compete in the best paper / teaching case competition, or submit a comprehensive abstract. Organized rountable proposal (90 minutes) may also be submitted. The page does also offer a separate link to register a Team for the Student Case Competition and a link to apply for student travel support . Submissions are reviewed AS RECEIVED. To assist authors with administrative processing at their end, please note the three cutoff dates below: They will guarantee that author will receive a decision via email in time to take advantage of the given early bird registration cutoff. Please be patient as the site is under development. The Paper fee due to IFAMR for an accepted paper / case will be 1,100 Euro starting Jan. 1, 2019. The current fee, 1000 Euro, will remain valid for all manuscripts submitted and received by Wageningen Academic Publishers not later than December 31, 2018, and for any paper / case already under review. Dr. Mike Gunderson, Executive Editor, IFAMR, Dr. Gerhard Schiefer, Chair of the Publication Policy Committee of IFAMA, and Dr. Francesco Braga, CEO, IFAMA, inform that on January 1, 2019 the Publication Policy Committee of IFAMA will assume the responsibilities previously discharged by the IFAMR Advisory Board. IFAMA wants to acknowledge the leadership provided by the many colleagues who served in the Advisory Board: IFAMR has grown over the years also thanks to you. A simple ceremony to acknowledge the past leadership of the Advisory Board members will take place during the Presidential Banquet at the 2019 World Conference. "European agrifood business in transition towards social responsibility", Guest Editor Loïc Sauvée. Please read the Call here.